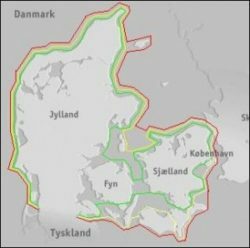 “The Red White Seal” is achieved by sailing around Denmark which is approximately 1100 km – 1500 km. To achieve “The Red White Seal” this has to be done on your own accord. No help, no safety boat and no planned depots along the route. “The Red White Seal” route can be sailed on three different routes. Lasse will be attempting a combination of the Red and Green route as seen on the image below.